Promotion runs from 11:00 GMT on 17th January 2019 – 22:59 GMT on 20th January 2019. 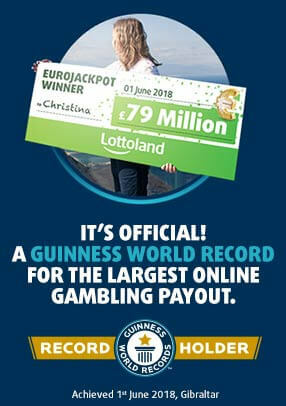 In order to participate in the promotion, players must be logged into their Lottoland account open any of the qualifying games and click claim within the promotional period. Qualifying games are: Jingle Bells, Rainbow Jackpots, Sumo Spins, Three Musketeers, Dragon’s Luck, Reel Heist, Arcade Bomb, Totem Lightning, Persian Fortune, Gems Gone Wild and Esqueleto Mariachi. Bonus Spins may be only be used on the following games: Jingle Bells, Rainbow Jackpots, Sumo Spins, Three Musketeers, Dragon’s Luck, Reel Heist, Arcade Bomb, Totem Lightning, Persian Fortune, Gems Gone Wild and Esqueleto Mariachi.